Dogs and cats are among the most popular pets. Therefore, it is only natural to compare both species. 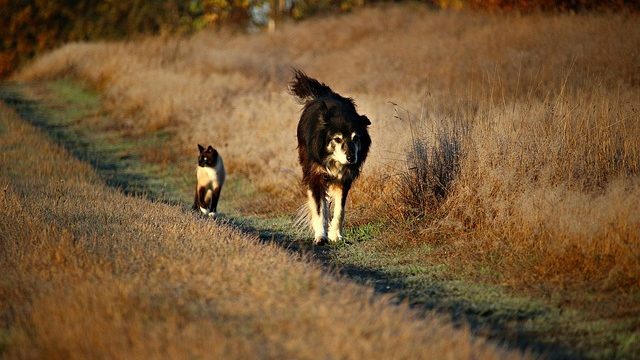 Here are some similarities between cats and dogs. Our two darlings may be more similar than we think! It is often said that dogs and cats have very little in common. While they differ in a variety of ways, the domesticated animals also have a lot in common. Your cat is a strict carnivore, although he can do the trash when he is free. He needs to feed himself several times a day (a cat that lives outdoors will feed several times a day depending on his findings during the hunt). The dog can eat anything, and unlike the cat, it will fill the stomach once or twice, not up to 15 times a day! The cat and the dog have in common their need for a bowl of clean water and free access. The cat is generally considered a somewhat territorial and independent animal. The dog is social and entirely dependent on man: he will, therefore, share his territory with him. Conversely, some dogs will be very concerned about their territories and defend vigorously while some tomcats will be extremely attached to their owners. It all depends on the character of the animal and its experiences! To feed, the cat begins to follow the eyes of small prey and awaits the right moment to jump on them, block them in his paws, and eat them. He is attracted to the small, which moves and hunts preferably at dawn and sunset. Based on this principle, offer him short phases of games in the evening or the morning, using adapted toys that will stimulate his pursuit instinct. The dog is more in the hunt, the search, the scent, the race, and the report. To stimulate it, it is often enough to offer new elements rich in smells, textures, and movements, or to take it out in the fresh air. The dog is a runner, the cat a jumper! One pursues his prey sometimes for a long time when the other catches it and leaps at the right moment. While we can easily invite a dog to contact, it is not the same for the cat: if he does not want to come to be caressed … he will not come. This choice must be allowed because it is part of his character traits. In the case of cohabitation between cat and dog, the development of the house must allow the cat to retreat away from contact with his roommate. Shelters in height allow because they are inaccessible to the dog. Once again a cat will also be able to search for the presence of his master and his cuddles; after all, each animal is different and has its character! While we can easily say the similarities between cats and dogs are many. You can invite a dog to contact, it is not the same for the cat: if he does not want to come to be caressed … he will not come. This choice must be allowed because it is part of his character traits. In the case of cohabitation between cat and dog, the development of the house must allow the cat to retreat away from contact with his roommate. Shelters in height allow because they are inaccessible to the dog. Once again a cat will also be able to search for the presence of his master and his cuddles; after all, each animal is different and has its own character!